On the river banks prefilled erosion control mats could be used. 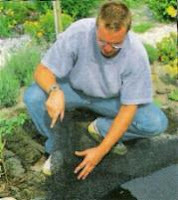 The mats may be filled with bitumen bound stone chippings, gravel or etc,. 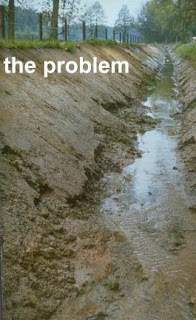 How does erosion control mat function? As seen on the picture above 3D mat is a three dimensional, structured, olive green (darker than the picture, you can see the speedlight lights) erosion control mat manufactured from polypropylene monofilaments. It is easy the installation slopes upto 60 degrees. Covered with soil after seeding. 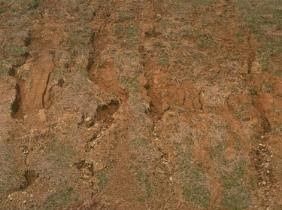 Provides instant protection against soil erosion due to wind, rain, and flash flooding. 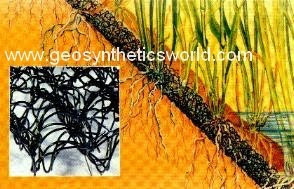 Creates an artificial root system. Helps nature. These type of erosion control products can be used for erosion protection of steep slopes, embankments, riverbanks, lakesides, shorelines, spillways, canals, and ditches. Also highly effective on golf courses and residential lawn areas. 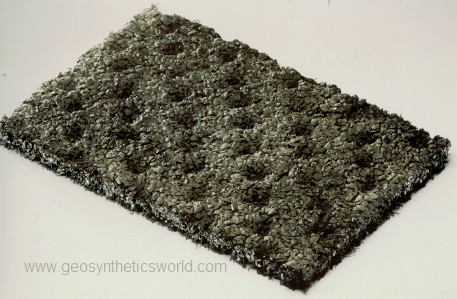 How does a three dimensional synthetic mat function? Decorative ponds for houses or even bigger ones like lakes are widely used by landscaping architects. If you construct a pond on the side slopes you sometimes put some small sized gravel and some plants. The plants and gravel or soil sometimes slide down to bottom of the pond. 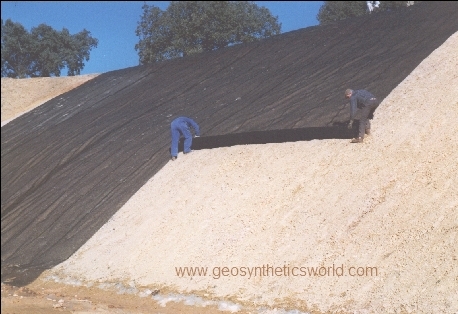 3 dimensional geosynthetic mats for erosion control or 3D mat type green slope materials may help for this purpose. On the membrane you can cover with a protection (nonwoven geotextile) and use mat. These mats can also be used in fish ponds. For the noise reduction property of the mats please check fountain section. 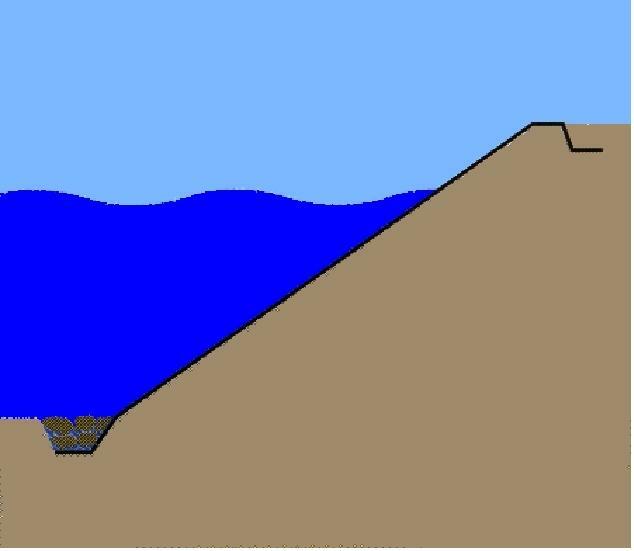 How can we control erosion? In nature it often takes thousands of years till erosion has stopped and a gradual building up of a natural, vegetal cover has taken place. Mankind can make artificial protection with concrete, stone, wood, etc. or help nature to establish a natural cover. 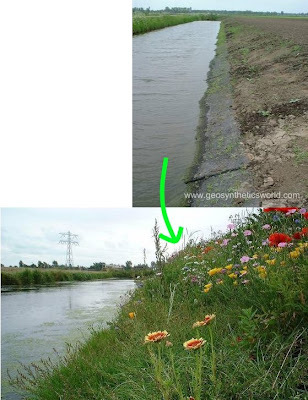 Also it is possible to use prefabricated plastic erosion control products. Three-dimensional erosion control mattings, made of polyamide monofilaments welded together where they cross, with an open space of over 95%. 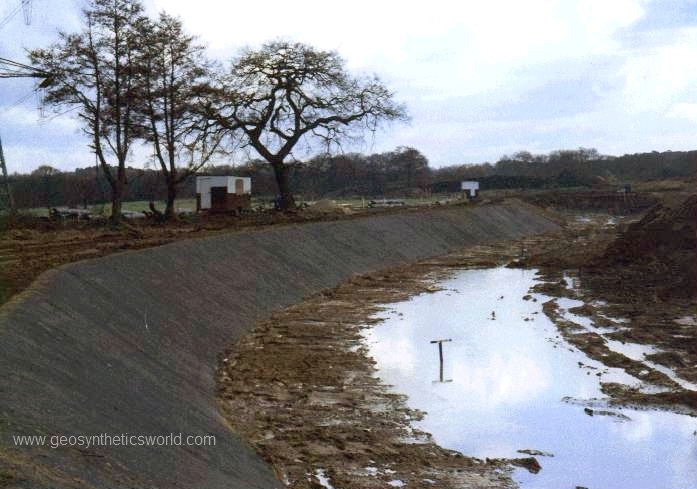 What is Erosion and why erosion control? during the erosion process soil particles are transported, resulting in the gradual deformation and destruction of slopes, banks, shores, rivers bottoms, etc. 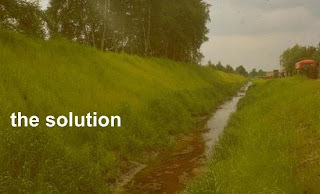 elsewhere, erosion causes undesirable sedimentation on agricultural land and roads, in rivers and drainage systems, etc. 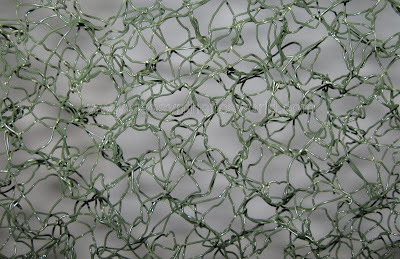 Enkamat and wiremesh hold soil particals, stones and seeds. The Enkamat functions as a griplayer for hydroseeding. First Enkamat is installed on the slope and then on it wiremesh. As the green of the first hydroseeding does not cover the whole area, a second hydroseeding is needed. Climbing plants have been planted in the toe of the slope. The last picture is taken one year after installation. Especially near the roads you may have a green beautiful view.